Just yesterday, a news item disturbed my calm . . . Apparently, the number one and number two ranked Cable news channels are Fox News and MSNBC. I hadn’t been tracking this and I normally would not care except for one simple fact . . . both of those “news” channels are rife with conspiracy theories presented in earnest and with gusto to avid viewers not just willing to soak them in but outright starving for them. Granted, their combined total viewership is relatively small in the scheme of things. Still, as if it needed any more shaking, my faith in human nature and my confidence that humanity as a whole is aiming higher suffered a blow. Believe it or not, I do occasionally try and watch cable news. The two reasons I can often last as long as three or four minutes are this: one, if a commercial break occurs while I’m watching and, two, the fact that I have resilient brain cells. Even so, no more than three minutes before I have to rip myself away lest I throw my coffee cup at the television. Mind you, were I not renting and were this my television, that’s a satisfying and cathartic act I would seriously consider. Anyway, I’ll keep this short because there’s not much I can say about the current state of affairs that hasn’t already been said. Still, think handbasket and a road to a very hot metaphorical place. These are palms leaves right outside the condo I’m renting. These leaves die off and when they do, they turn a coppery color that is a great contrast to the green that surrounds it. I’ll probably do a series of these, but for now, a neon treatment using the Topaz Glow plugin and Topaz Studio adding an appropriate digital frame. This next cartoon is a favorite of mine and I keep waiting for the opportunity to use a similar response (complete with the end disclaimer). I first need to memorize an appropriately “deep” response at least similar to the one in the strip. I would come up with one right now but I’m listening to music and therefore can’t think “deep” thoughts just for fun. I’m keeping this short for them who be tired of me going on and on about this or that stuff. 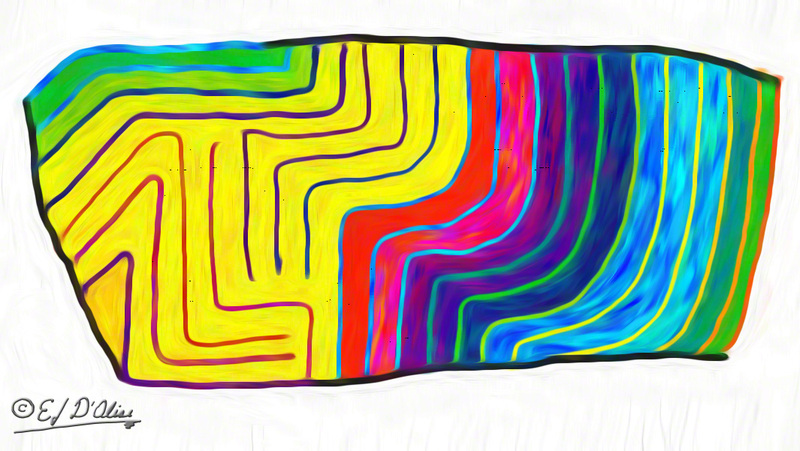 Here’s today’s Doodle — Seismic Color Disturbance. I limit myself to no more than 2 hours TV a day! It’s not how long . . . it’s what you watch. I could easily watch multiple hours of a good series (Firefly) or movies (Hitman or Joe Versus the Volcano or Local Hero). Once Upon a Time in the West, The Good the bad and the Ugly, Silverado, Quigley Down Under, The Outlaw Josey Wales, The Magnificent Seven (original), Open Range, Rio Bravo, The Comancheros, and a few others. I quit watching local and national TV news years ago. For a number of reasons. I won’t go into them here. Okay…I’ll admit, occasionally I turn on CNN for a few minutes. But it’s for a very shallow reason…I like to look at Anderson Cooper. Sometimes I don’t even have the sound on. I’m just looking. PHOTO: Gorgeous! Very peacock-y palm leaves! CARTOON: HA! A philosophical diner chef! Love him! Oh, and I do love me some catsup! DOODLE: Bright! Bold! Wavy! Cheery! And it’s seismic-ness rocked my socks off! PS…I ate some broccoli in your honor last night. Thanks, Carolyn . . . about the comments, not the broccoli. I’ll make sure to eat something to cleanse the mental image of broccoli being eaten. You know, you could always write Cooper and ask him for an autographed photo. That way, you wouldn’t have to watch the news at all. You might even strike up a penpal relationship with the man. Happy Friday (and weekend) to you as well. Ha! Sorry. Just had to tease about the broccoli. I think there’s a wide range of lacking stuff . . . but I wouldn’t worry too much about it if I were you. Which, you probably already do . . . not worry about it, that is. If colors had sound, your photo would look and sound like a firework! It’s really lovely. 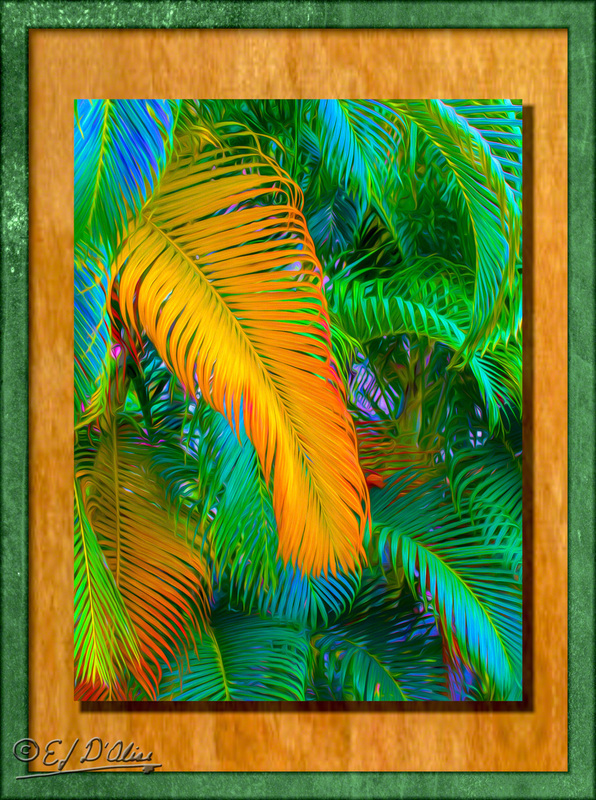 And, your doodle is a rather abstracted rendering of Hawaii . . . lava flows, volcanoes, hills, greenery, ocean, etc. Actually, it’s quite good. Thank you . . . although I think it’s abstract to the extreme. So much so that it could also be a Lego shop.